Distributing optimized snow stakes across a wide area and regularly photographing with drone cameras seems like a great application of the technology. In this final segment of my mini-series on drones and mountain science, I’ll address a couple of ways in which I would personally use the technology right now. This is different from the remote-sensing application addressed previously, in the sense that only a basic camera would be required. 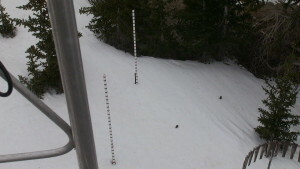 Current snow-depth survey data are limited by how many sites can be serviced at a time. There are also significant data-reliability issues related to uneven snow distribution across landscapes. 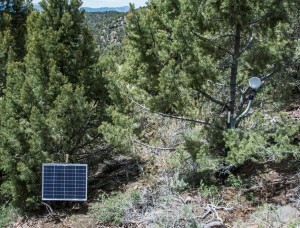 If snow depth cannot easily be measured by a remote-sensing technique across large areas, the alternative is to have as many point-measurements as possible. Drones can easily take photos of dozens of snow stakes within a few minutes across a wide area, dramatically changing the sample size going into snow depth estimates. Again, using pre-programmed flight paths and optimized camera/stake designs, this doesn’t sound very far-fetched to me. At the moment, I’m relying on a few stakes scattered within zooming distance of the PTZ camera on my high-altitude climate stations. But knowing how the snow depth/accumulation/ablation changes over the course of the season on the entire mountainside would be a lot more interesting. This remote monitoring setup keeps a low-profile, but still manages to connect to my main network several times per day on a schedule. Voltage cutoffs are designed to favor 100% logger operation and reduce power consumption by the radio. I had to set up a specific relay radio for this site, but with a drone it would be easycakes. OK, we’ve talked about using the drones to observe phenomena directly. But there is yet another potentially very valuable use of drones in complex topography besides science observation and equipment inspection. Remember back when I was talking about the need for real-time communication into data collectors, as opposed to manual servicing? Well, read it then. 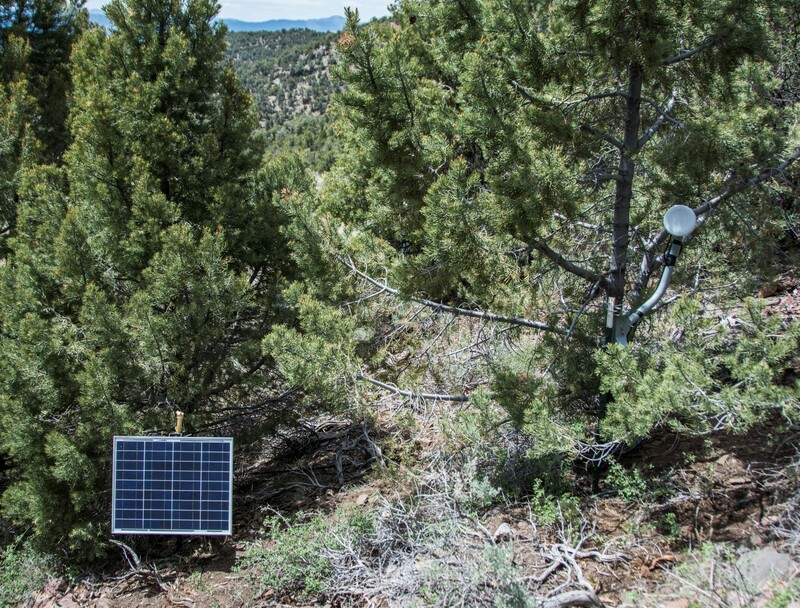 Basically, because of how the physics of RF work, terrain and vegetation obstructions make it difficult to get terrestrial wireless into every nook and cranny of a mountain. Essentially, you have to sort of engineer every connection so that it will work; low-power automated mesh-type systems just do not cut it over large landscapes. Nevertheless, it is often precisely in all of these hard-to-reach places that the most interesting ecological and hydrological science observations will take place. It’s possible to deploy systems with minimal power requirements and simply schedule the networking radio to turn on infrequently. As long as you know when it is supposed to come up on the network, your data acquisition software back home can grab the new observations. The only challenge with these types of deployments is managing the RF network side – ensuring that signal from each location can actually get out to a relay point without interference. But what if the relay point was not way up on a cliff’s edge, or down a narrow canyon, or around a corner? What if you simply turned your drone into a relay point? That’s right – fly a temporary network comms link within easy RF signal reach (overhead) of dozens of deployed loggers distributed across the landscape. No more need to monkey with mesh protocols and all of their limitations, no need to worry about a single critical link failing. I know some hobbyists who have already successfully flown very-high-speed secondary telemetry from drones, and this is a trick that definitely will work. Yeah, I know. I need to start a company and produce science-specific systems. Well, FAA and institutional liabilities people, are you going to make it easy for us to use the technology for field science? I certainly hope so, because it potentially has a very bright future.